The holidays are here, and if you are like me, you're trying to find the perfect gift for everyone on your list. You've got the mailman, the babysitter, the teacher…what to buy for those folks for whom you want to show appreciation, but have no idea what their tastes are? 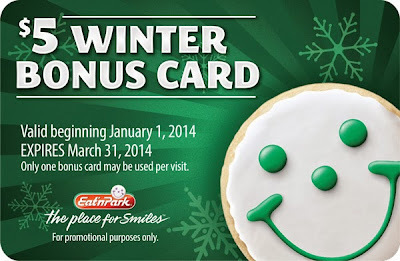 Don't fret – everyone loves Eat'n Park gift cards! And for a limited time, you'll get a FREE $5 bonus card* with every $25 in Eat'n Park gift card purchases at our restaurants. It's like a reward for being such a great gift-giver! 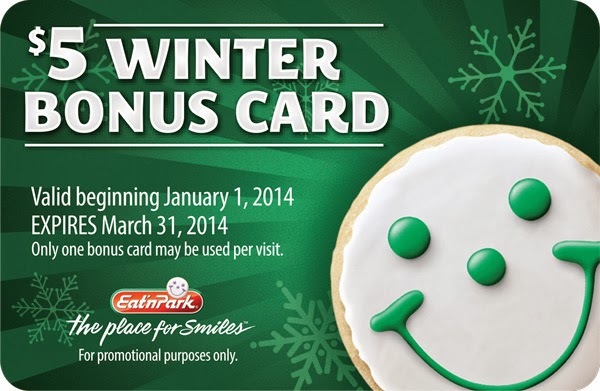 Bonus cards are valid from January 1 through March 31, 2014. Once the hustle and bustle of the holidays is over, you'll have a little treat for yourself. You'll get one $5 bonus card for every $25 in gift card purchases, regardless of the denomination. So, if you buy five $5 cards, you'll get one bonus card. Buy $100 worth of gift cards, and you'll get four $5 bonus cards. But here's the catch: We only have a limited supply of bonus cards, and we can't make substitutions. So when they're gone, they're gone! Stop in to your local Eat'n Park today to get yours, then relax – holiday gift-giving doesn't get any easier than this! *Bonus cards are only available at Eat'n Park restaurant locations while supplies last. This offer is not available with online gift card orders or e-gift cards. Bonus cards may be redeemed one per check from January 1 – March 31, 2014. Multiple bonus cards cannot be redeemed on the same check. Congratulations 2014 Ford Fusion Winner!